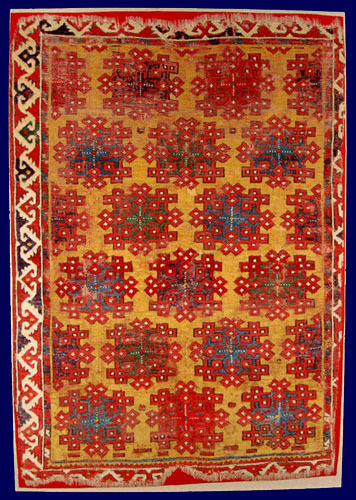 This oft-published icon of the rug world has an endlessly repeating design of offset rows of rectangular medallions with interlaced knots on the main axes and at the four corners. A similar form can be seen on 15th century Mamluk carpets from Cairo, as well as on 17th to 19th century Turkoman carpets from Turkmenistan, where this motif is known as a gul, meaning flower or emblem. It is probable that this tribal symbol found its way to Anatolia with Turkoman tribes in the 13th and 14th centuries. Rugs with Interlaced-Guls are depicted in two Italian paintings: Francesco de Giorgio Martini's Federico di Montefeltro, Duke of Urbino and Another Man, 1475, and Ambrogio Bergognone's Madonna and Child with Saints, dated to the 1490s. 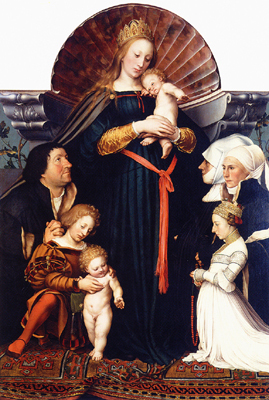 A third painting, Hans Holbein the Younger's Virgin and Child, 1528, in the Schlossmuseum, Darmstadt, depicts a carpet with Interlaced-Guls in compartments, thus combining the design schemes of the Bode and the Halchiu Diamonds in Compartments rugs (exhib no. 1). The very beautiful border motifs on the Bode rug, sometimes interpreted as elebelinde or 'mother goddess' symbols, here probably portray a Great Bird, a symbol of protection.